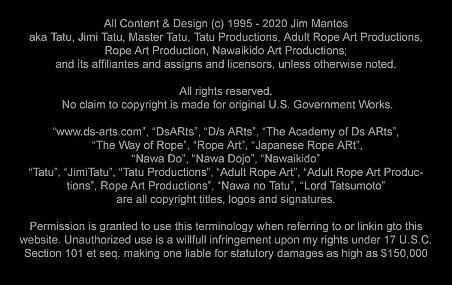 Note: The following text is the "Keynote Address" given by Tatu at the opening ceremonies at Shibaricon II in Chicago, Illinois on May 27, 2005, as "Aikemi" (shevah) prepared and served guests illustrating tea ceremony similar to that of a traditional Japanese Tea Ceremony. The Japanese Tea Ceremony is not really a ceremony. The Japanese word is "cha-na-yo", literally means, "hot water for tea". There are two major schools of Tea. Urasenke prefers the word chado. Omotesenke prefers the original word sado. In 1964 Urasenke decided that they would stop reading it sado, because of the unwanted connection to another form of sado, namely the abbreviation of sadomasochism. So to avoid this when they wanted to teach english speaking people about the way of tea they decided to read it chado instead. Cha being another way to read the tea kanji. Sen Rikyu (1522-1591), the man who devised the tea ceremony a little over 500 years ago in it's present form was asked, "how do you do tea ceremony"? He responded, "first you boil water, then you mix the tea, then you serve it to your guest." So one asks, why then are people studying it for 25 years? Why does it take so long to become a Tea Master? The answer is because there are over 200 ways to boil water, mix tea, serve guests depending on the day, the season of the year, the level of formality, the number of guests, the number and type of implements and the size of the room. Wa. One practices harmony between the host and the guest, all things in the world. Harmony is made up of all the different things that make up our world. Harmony is seen in the way people act and behave among one another. It is seen in the way the Japanese places great emphasis on aesthetics, the gardens, tea flowers, tea bowls, bonsai, candles, colors, aromas, etc. In a tea ceremony the participants communicate in silence with each other through every element in the setting as the host uses them to call out a sense of harmony in the tearoom. While there is never total agreement on all matters of life, we celebrate the harmony of kindred spirits. So should we celebrate the harmony of our individual D/s bents. Kei. One learns respect for traditions, the implements, and each other. Respect. People must respect all things, all matters without involving their status or position in life; that is, people must not judge or discriminate. In the way of tea, all participants historically crawl in a lowly position into the tearoom, all kneel and enjoy the harmony together. Without respect there is no community. This does not mean all agree, but we are willing to celebrate our uniqueness with one another without being threatened or ashamed. Sei. One gains purity both inward and outward. Purity. Purifying spirits is very important since the ideal spirit of the ceremony is one where there is truth, and honesty with ones soul. To share the fullness of the moments, all participants look inward introspectively, and judge their own hearts and motives. Jaku.. One finds tranquility by living a life of harmony, respect and purity. Tranquility. Only after the first three concepts (harmony, respect, and purity) are discovered, experienced and embraced, can people finally embody tranquility. This was the teaching of Rikyu the great 16th century "Tea Master". Walking the "way of tea" or the "way of rope" is not easy because the way of tea is a life which people seek tranquility through harmony, respect, and purity, yet this is not the way of most in our world. For many their way is full of chaos. Many people simply just have no desire for tranquility. They are not at peace or in harmony with themselves, or anyone. Their lives are lacking purity. Their pasts are tainted with secrets, hideous shameful events for which they have never dealt successfully or tried to be honest and true with themselves or others. How do these differences in mindsets manifest itself in our D/s community and play? Be warned, if you are seeking the way of tranquility, there will be those with no peace who will target and test you in every way possible. Some will just become outright unscrupulous in their attempts to undermine you. You must understand you will be different, and some people don't like that. One who follows the way of discord, greed, and ego while doing D/s may very well develop a worthless or low value submissive philosophy. They see a definite superiority of classes in their D/s. Doms are gods, subs are doormats, not real flesh and blood with feelings and emotions, they are pieces of meat to be used. They organize their environments almost in godfather fashion. Seeking to control and manipulate with their power. Often these Dominants are not Dominants at all ,but domineering jerks, trying to demand respect. Low self-esteemed individuals (Dom and subs) are attracted to this style, because they feel they can get instant gratification for what they lack in character. Because of their low self-esteem they can feel it necessary to be critical and unkind to others, capable of using very destructive words and deeds. They do this because in order to make themselves feel good about themselves, they compensate for their lack of self-esteem by attempting to lift themselves up by knocking others down. On the other hand, with a mindset dedicated to the way of tranquility at work in D/s, there is more likely to be a mutual love and respect at work between Dominant and submissive and in the community. Dominants with this mindset never talk down about submissives. They see them as wonderful people, special, unique to be cherished and cared for. They understand the beauty of the service given to them and responds with great love and affection. There may be correction and punishment, but never given in rage or anger or fear, but with love and discipline. Respect is not demanded by the Dominant, he doesn't have to prove himself to anyone. Respect is given by the submissive because she has been loved and treated with honor and she sees her Dominant as worthy of respect. Of great importance to the Way of Tea is the concept of kokoro ire. Written with two characters, the first character "kokoro" represents "heart-spirit-mind" the second, "ire" means "to put in." In other words, the host puts his whole being into the intent of creating an atmosphere wherein the guest can find tranquility. It is said of "tea people" that they live long and healthy lives. I have live a half a century now, ask me in another half century and I'll tell you if it works. If it does, part of the reason will be the tranquility that come from practicing tea ceremony, and part of the reason will be in the tea itself. The tea is called, "macha". The actual tea is picked on the 88th day after the lunar New Year, which is in early May. You seam and dry the leaves under a silk cloth, to retain the color. Then you place it in a container and let it sit for six (6) months until early November when the containers are opened. The dried leaves are ground into a very fine powder. The powder is dissolved in boiling water and served to guests. So "macha" tea is a green color with the natural flavor of tea, with all the nutrients, vitamins, minerals, phito chemicals, riboflavins, etc. It is in the last 20 years the modern scientists have discovered in their studies that tea is good for you, what tea people have known for the past 1500 years when it was first brought to Japan as a "medicine". People back then used to pop tea pills for the same reason we take vitamins and mineral supplements. One is forced to concentrate on the beauty of the individual things and all things. A Tea House is not like a theme park where you are overwhelmed with experiences, but rather a discipline of concentration much like the martial arts. 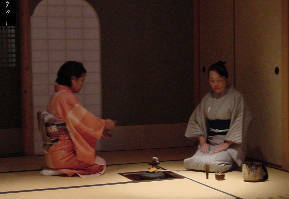 A complete tea ceremony is called a "chaze" and takes about 3 hours. It begins by fixing the charcoal and wood under the water and serving a meal called "kiseck". Then 2 bowls of tea are served. One is a thick tea and a 2nd a thin tea. Tea is not where people talk a lot, in fact the most impressive and most significant gestures are those that go unspoken. (Guest) Before entering the tearoom, the guest stops at a basin of water "tsukubai" and takes a ladle and scoops water and washed her hands and then mouth. She uses a handkerchief to dry and puts away inside her kimono sleeve. She walks to the door to the tearoom and opens the door. It is a small sliding door called a "fusuma", which carries meaning of "all are the same in this place". Japan was a social class system, but in this place we are all the same. She places her fan "sensu" on the tatami mat in front of her, then places her hands on the tatami mat and looks inside and bows. She turns and drops her shoes and puts them to the side. Enters and then closes the door. She then walks to the alcove or "tokonoma" and kneels, placing her fan in front of her. She admires the art and the flower and bows to each. She then stands (from left foot) and walks to the preparation area, kneels, bows and places her fan in front of her. She looks at the fire, the water pot / kettle "kama", and lays out the implements. She then stands and walks to her guest position near the door. She places her fan behind her. This comes from the fact that the Tea Ceremony was celebrated by only men up until the time when Tom Cruise arrived in Japan… ha!! (about the 1880's). Yes, the Tea Ceremony was actually a part of the Samurai class, and the fan in emblematic of the sword, "the katana", and placing it behind you, says this is a place of harmony not hostility. (Host) opens and internal door on other side of teahouse. She enters on knees. (Guest) "thank you for inviting me" and they bow again. (Host) replies something like, "no, thank you for your coming and giving me the opportunity to serve you." They bow again. (Guest) returns to her position and the host on knees slides out her door, and at the door they bow again. (Host) returns with the candy dish and takes it to the guest and places on the tatami mat. They bow and host exits the room again. (Host) returns to the tearoom with the macha (tea) container. She closes the door and walks to the preparation area. She sets out the implements in front of the guest, and as a gesture of respect and purity she cleans each implement. She takes out her orange cloth from her obi. She takes a scoop of water pours it into the tea bowl. She swishes it around and takes the scoop & the Wisk and dips them in the water, cleaning each. She then dries each with her cloth. The Wisk (chasen) is made of a piece of darkened bamboo cut into as many as up to 120 strips and molded into a beater shape. The Ladle (hishaku) is also made of bamboo, as is the tea scoop (chashaku). When Sen Rikyu chose to use bamboo for his implements, some people said he was showing disrespect to his guests, using such common materials, but he said he was taking something from nature and turning it into a work of art. The host now makes the tea. This is when the guest eats the candy. Host scoops (chashaku) the macha tea into the bowl, scoops the water with the ladle (hishaku) and pours into the bowl, and mixed with the wisk (chasen) . She sets the bowl to her side toward the guest, turning the design on the bowl to face the guest. Guest now stands and walks to the bowl. She kneels, picks it up and then returns to her guest position. Kneeling she places the bowl on the mat. She picks back up holding it up in a prayerful manner as if to give thanks, turns the bowl so design is away. Guest drinks the tea. It is good manners to slurp the last sip. 2) For this bowl you have chosen for this specific occasion. She picks up the bowl and admires it. Guest then stands and returns the bowl to the host. Host now cleans the bowl. She takes a ladle of water and pours into the bowl and swishes around. She dips the wisk in it to wash off. She then pours it out into a waste bowl "kenwui". This is all an unspoken gesture to the guest as if to say, "I know you have to go, but when you return everything will be clean and ready for you". The silk cloth she uses is called a "fukusa". Ladies carry orange and men, purple. The way the cloth is held vertical, and folded symbolizes heaven and earth coming together. Tea is NOT a religious ritual, but there are recognizable religious influences on the ceremony. When the Tea Ceremony was being developed in the 1500s, there were 2 religions vying for supremacy in Japan; Zen Buddhism and Roman Catholic Christianity. At that time Japan was about ½ Buddhist and ½ Catholic. Elements of each are seen in the Tea Ritual. The Host now concludes, host and guest bow. Guest may ask to see some of the implements or may depart. Host exits room and guest returns to alcove to bow. It is said of tea ceremony "ichi-go - ichi-e", meaning "one time - one life". Reminding us that we have "each moment only once", that the past is gone and the future may never come. Your whole life, really only exits in the moment. So as you are experiencing it, hold on to it. Guest admires fire pot one last time and then departs making noise with door, so host know she is about to leave. Once outside host reappears and opens door and looks out at her guest and they speak final goodbyes. Host retrieves the candy dish and takes out of the tearoom. chashaku..........is a scoop which is used to carry matcha from the chaki or chaire to the chawan.